Women Not Entitled to Alimony. "The allowance made to a woman by an order of court, from her husband's estate or income, for her maintenance after her divorce or legal separation from him, or during a suit therefor" ("Standard Dictionary"). This is its definition inmodern law. Strictly speaking, under Jewish law the divorced woman had no Alimony. The Jewish law, however, provided for the divorced woman by the marriage contract or marriage settlement, the substantial results of which were the same as those secured in modern times by an order of court. The marriage contract or settlement (Ketubah) must be in writing. By the ketubah, which a husband gives to his wife, a certain sum of money is secured to her by her husband, to be paid out of his estate upon her widowhood or divorce. The sum thus secured to the wife is a lien on his estate, prior to all other debts; and it may be collected out of property which is no longer in his possession, even though it has been transferred to a third person (Ket. 82b) should he have no estate in possession sufficiently large to pay it. Consequently, as soon as a woman was divorced she could make demand for the payment of the amount guaranteed her by the ketubah; and the judges that presided in the divorce proceedings would enforce its payment. Originally, the amount thus secured to the wife was paid to her father; and late in Talmudic times this was still the law in cases where the wife was a minor or was divorced before the marriage had been consummated. Eventually, however, the money was settled on the wife; remaining undivided in the estate of the husband, and being made payable to her on her divorce or widowhood. As the heirs of the husband often defrauded the widow of her rights, it was ordained that the amount of the marriage settlement should be deposited with the father of the bride, thus making it secure against the adverse claim of her husband's heirs; but as it was the original purpose of the marriage settlement to act as a check upon the husband so that "it shall not be easy in his eyes to divorce her," the deposit of the money with the father of the bride destroyed the effect intended; for, the husband having no further payment to make, there were no financial considerations to hinder him from "giving" divorce whenever he pleased. It was thereupon provided by law that the amount of the marriage settlement should be invested in articles of value, and that these should remain in possession of the husband. This regulation, however, was found to give no greater satisfaction than the former one; for it was very easy for the husband to give the articles of value to his wife and to tell her to go. 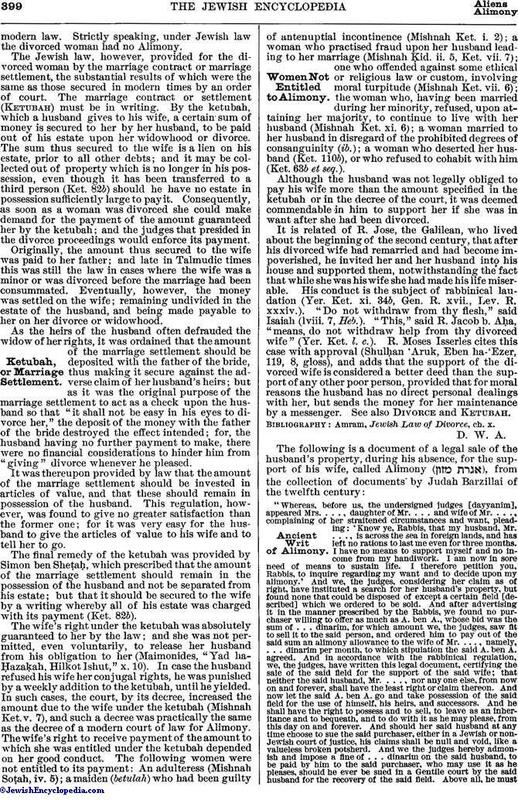 The final remedy of the ketubah was provided by Simon ben Sheṭaḥ, which prescribed that the amount of the marriage settlement should remain in the possession of the husband and not be separated from his estate; but that it should be secured to the wife by a writing whereby all of his estate was charged with its payment (Ket. 82b). 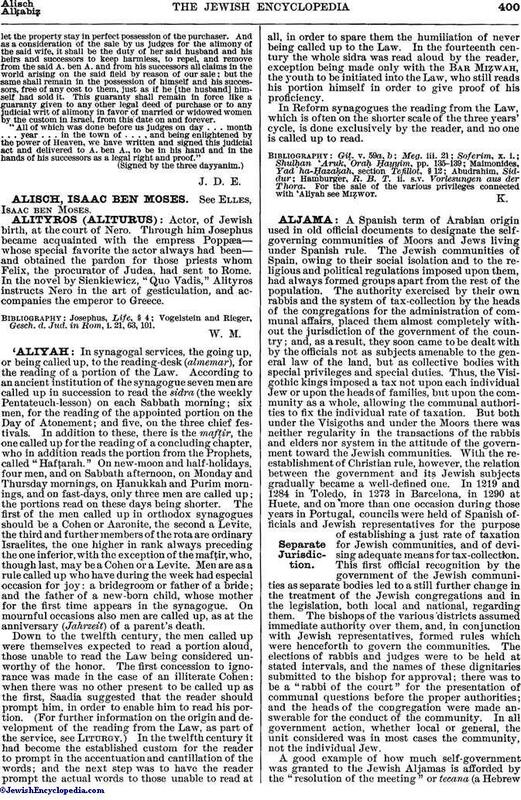 The wife's right under the ketubah was absolutely guaranteed to her by the law; and she was not permitted, even voluntarily, to release her husband from his obligation to her (Maimonides, "Yad ha-Ḥazaḳah, Hilkot Ishut," x. 10). In case the husband refused his wife her conjugal rights, he was punished by a weekly addition to the ketubah, until he yielded. In such cases, the court, by its decree, increased the amount due to the wife under the ketubah (Mishnah Ket. v. 7), and such a decree was practically the same as the decree of a modern court of law for Alimony. The wife's right to receive payment of the amount to which she was entitled under the ketubah depended on her good conduct. The following women were not entitled to its payment: An adulteress (Mishnah Soṭah, iv. 5); a maiden (betulah) who had been guilty of antenuptial incontinence (Mishnah Ket. i. 2); a woman who practised fraud upon her husband leading to her marriage (Mishnah ḳid. ii. 5, Ket. vii. 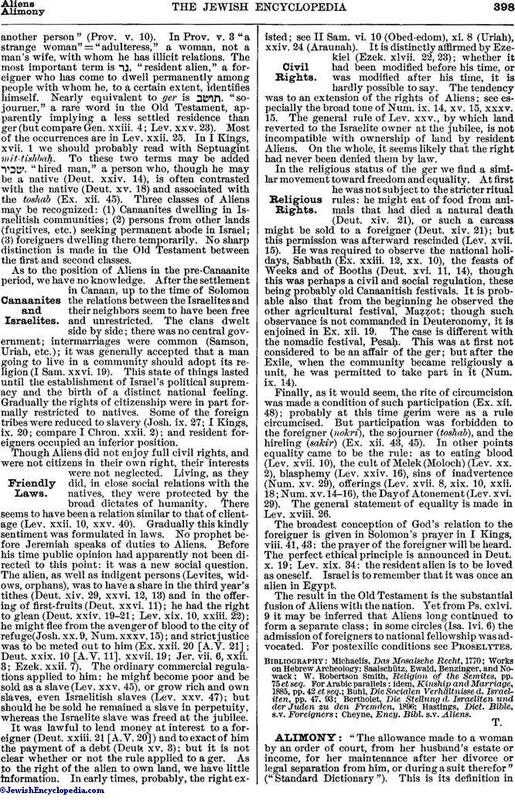 7); one who offended against some ethical or religious law or custom, involving moral turpitude (Mishnah Ket. vii. 6); the woman who, having been married during her minority, refused, upon attaining her majority, to continue to live with her husband (Mishnah Ket. xi. 6); a woman married to her husband in disregard of the prohibited degrees of consanguinity (ib. ); a woman who deserted her husband (Ket. 110b), or who refused to cohabit with him (Ket. 63b et seq.). Although the husband was not legally obliged to pay his wife more than the amount specified in the ketubah or in the decree of the court, it was deemed commendable in him to support her if she was in want after she had been divorced. It is related of R. Jose, the Galilean, who lived about the beginning of the second century, that after his divorced wife had remarried and had become impoverished, he invited her and her husband into his house and supported them, notwithstanding the fact that while she was his wife she had made his life miserable. His conduct is the subject of rabbinical laudation (Yer. Ket. xi. 34b, Gen. R. xvii., Lev. R. xxxiv.). "Do not withdraw from thy flesh," said Isaiah (lviii. 7, Heb.). "This," said R. Jacob b. Aḥa, "means, do not withdraw help from thy divorced wife" (Yer. Ket. l.c.). R. Moses Isserles cites this case with approval (Shulḥan 'Aruk, Eben ha-'Ezer, 119, 8, gloss), and adds that the support of the divorced wife is considered a better deed than the support of any other poor person, provided that for moral reasons the husband has no direct personal dealings with her, but sends the money for her maintenance by a messenger. See also Divorce and Ketubah. Amram, Jewish Law of Divorce, ch. x. "Whereas, before us, the undersigned judges [dayyanim], appeared Mrs. . . . , daughter of Mr. . . . and wife of Mr. . . . , complaining of her straitened circumstances and want, pleading: 'Know ye, Rabbis, that my husband, Mr. . . . , is across the sea in foreign lands, and has left no rations to last me even for three months. I have no means to support myself and no income from my handiwork. I am now in sore need of means to sustain life. I therefore petition you, Rabbis, to inquire regarding my want and to decide upon my alimony.' And we, the judges, considering her claim as of right, have instituted a search for her husband's property, but found none that could be disposed of except a certain field [described] which we ordered to be sold. And after advertising it in the manner prescribed by the Rabbis, we found no purchaser willing to offer as much as A. ben A., whose bid was the sum of . . . dinarim, for which amount we, the judges, saw fit to sell it to the said person, and ordered him to pay out of the said sum an alimony allowance to the wife of Mr. . . . , namely, . . . dinarim per month, to which stipulation the said A. ben A. agreed. And in accordance with the rabbinical regulation, we, the judges, have written this legal document, certifying the sale of the said field for the support of the said wife; that neither the said husband, Mr. . . . , nor any one else, from now on and forever, shall have the least right or claim thereon. And now let the said A. ben A. go and take possession of the said field for the use of himself, his heirs, and successors. And he shall have the right to possess and to sell, to leave as an inheritance and to bequeath, and to do with it as he may please, from this day on and forever. And should her said husband at any time choose to sue the said purchaser, either in a Jewish or non-Jewish court of justice, his claims shall be null and void, like a valueless broken potsherd. And we the judges hereby admonish and impose a fine of . . . dinarim on the said husband, to be paid by him to the said purchaser, who may use it as he pleases, should he ever be sued in a Gentile court by the said husband for the recovery of the said field. Above all, he mustlet the property stay in perfect possession of the purchaser. And as a consideration of the sale by us judges for the alimony of the said wife, it shall be the duty of her said husband and his heirs and successors to keep harmless, to repel, and remove from the said A. ben A. and from his successors all claims in the world arising on the said field by reason of our sale; but the same shall remain in the possession of himself and his successors, free of any cost to them, just as if he [the husband] himself had sold it. This guaranty shall remain in force like a guaranty given to any other legal deed of purchase or to any judicial writ of alimony in favor of married or widowed women by the custom in Israel, from this date on and forever. "All of which was done before us judges on day . . . month . . . year . . . in the town of . . . , and being enlightened by the power of Heaven, we have written and signed this judicial act and delivered to A. ben A., to be in his hand and in the hands of his successors as a legal right and proof."